For months — long past its supposed July opening — the windows were papered over, thwarting sidewalk squinters who wanted a peek at the new Elite Cafe, wondering whether the new owners would preserve all that magnificent mahogany, the private booths, the historic bar and the New Orleans influenced menu. In early October, the paper came down and the 35-year-old eatery made its latest debut. The Elite Cafe has been reborn as a sleek, sophisticated midtown Manhattan restaurant with a revived slate of French Quarter offerings, but only faint traces of its Art Deco past. On opening weekend, locals and newcomers sized up the decor and the culinary and cocktail artistry of new owner Andy Chun and his hand-picked team of seasoned kitchen, libational and front-of-the-house heavies. To traditionalists, it was a shock. Gone are the rich, vintage mahogany appointments, the wooden bar and the swivel bar stools that had been there since the 1930s, the classroom chandeliers and lazy fans that threw off a mellow glow and the occasional breeze, the vintage sconces in the booths — and the weekday happy hour. New is a high, wide and handsome bar, booth tables and window seating ledges fashioned out of smooth Carerra marble, brass-topped community tables, massive framed mirrors and a floor of throwback-to-the-1920s white hexagonal tile. 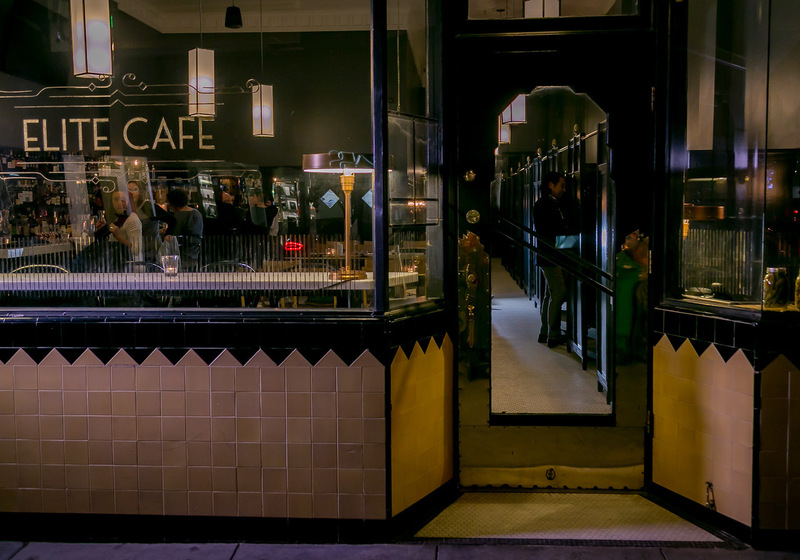 For Elite Cafe loyalists and historical purists, the biggest jolt seems to be the new paint job — charcoal and a deep blue-gray — and all-new lighting. Clearly, Chun, a 40-year-old Dartmouth MBA who once worked for the Bain & Company management consultancy, isn’t aiming for nostalgic romantics with the new decor. He can see how the new breed of Fillmore retailers are stylish, worldly, pricey and targeting the young and the well-heeled in the neighborhood. Chun, who owns four other bars and restaurants in San Francisco, has planted his feet in both worlds. For the food lovers, he’s hired New Orleans born chef Chris Borges, who has come up with a creative menu pairing some reimagined old standbys with new exotic sounding dishes straight out of Voodoo City. 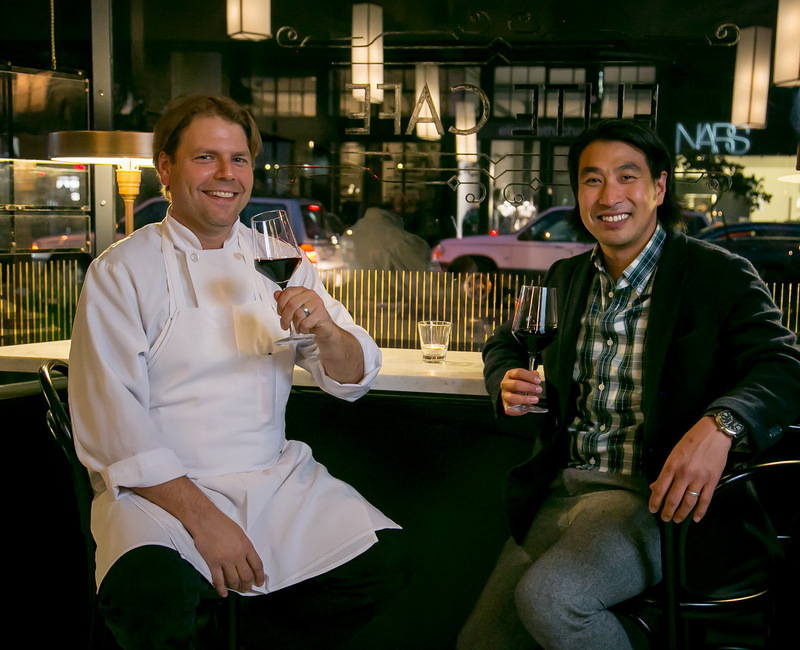 New Orleans native Chris Borges, the Elite’s new chef, and new owner Andy Chun. Gastronomically, Borges hasn’t tried to turn the Elite into a fussy Antoine’s or a Fillmore version of Commander’s Palace. It’s classic Creole, but casual. Temptations abound. For my money, Andy Chun’s triumph is the bar — flat-out the best in the Fillmore today. The new Elite’s full-time bar manager, Brian Nelson, is a real pro drinkmaker who knows his way around New Orleans and seems always to be on duty, teaching his young up-and-comers the fine art of how to make a cocktail correctly, while smiling and chatting up customers, all simultaneously. Nelson’s boss Kevin Deidrich carries the title bar director for Chun’s small but growing empire. He’s making the Elite’s bar stand out from the crowd by adding a “caddy” to every cocktail served up or on the rocks. True, the cocktail glasses are a tad smaller today than in the Elite’s previous incarnation, but the presentation is far more elegant. As a manhattan fancier who doesn’t much like the melting ice diluting my bourbon, I was pleased to see the up version arrive in a delicate, engraved glass with a back-up rocks glass holding the small caddy filled to the brim with the excess nectar that many bartenders who freepour often toss after they fill your glass. Do the math and you’re getting a drink and a half. Even more impressive is the fact that the new Elite has a five-star well. It features costlier top shelf spirits, normally reserved for call drinks, used to make basic cocktails at a lower price. For instance, a colleague ordered a Grey Goose and soda on the rocks at the new Elite and paid $13.50 for the privilege. A well vodka and soda would have been made with San Francisco’s own Skyy for $2 less. Unless you’re sipping Goose neat or full-strength in a martini, save the two bucks and get a fried egg for your hamburger. 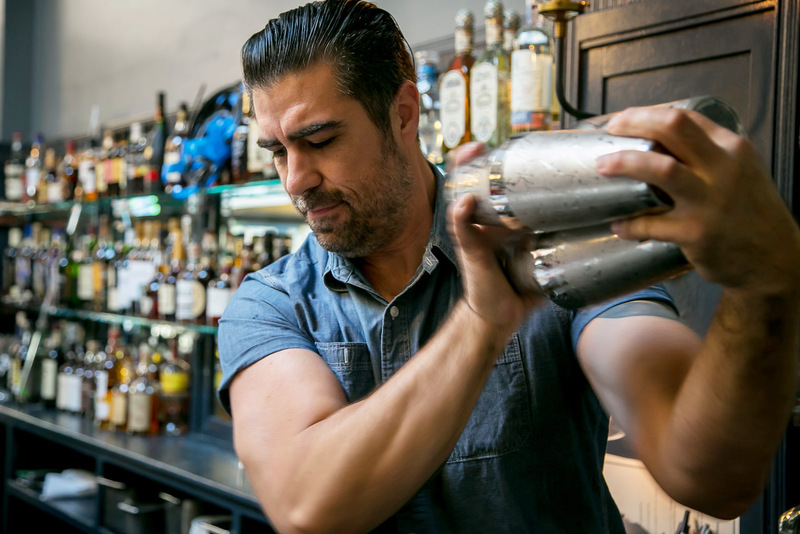 Bar manager Brian Nelson is a pro drinkmaker who seems always to be on duty. The same is true for the manhattan or any bourbon drink at the Elite. Nelson has Evan Williams black label 86-proof in the well, which is smoother than the boring, bland, basic 80-proof Jim Beam stocked in virtually every bar today. Granted, Williams black is not craft bourbon, like Basil Hayden or Knob Creek, but it’s good value for the money and Chun and company deserve an attaboy for ponying up. Other brands — some well known, some not — down in the new Elite’s well: Beefeater London dry gin;, Plantation 3-star 82.4 proof with a blend of rums from Jamaica, Barbados and Trinidad; Arette Tequila, 100% pure blue Agave; Vida, 100% Mescal from Oaxaca; H. by Hine, a Cognac that’s rarely found in a well; Cutty Sark Prohibition Scotch; Suntory Japanese whisky, which I’ve never seen in a well, and Rittenhouse Rye, 100-proof bottled-in-bond, which may be the best deal in house. Whoever came up with the house cocktail list did it the smart way: concise, drinkable and not off-the-wall crazy. The Champagne julep sounds seductive: sparkling wine, mint and H by Hine Cognac, $13. Cameron’s Kick sounds, ah, different: Monkey Shoulder American whiskey, Tullamore Dew Irish Whiskey, orgeat and citrus, $12. The Tea Clipper mixes Cutty Sark Prohibition blended Scotch with apple-flavored Pommeau, maple syrup, cinnamon and allspice, $13. A couple of other nifty ideas are behind the bar, including a Frozen Irish Coffee and a Frozen Hurricane made with two rums, Galliano, citrus, passion fruit and bitters, which goes for $13. Four tap brews and four bottled suds are the extent of the beer list. However, the new Elite has a large number of wines by the glass, mostly French and California vintages, starting at $10 but averaging $11 to $14, with a couple of $20 to $22 reds offered. The wine list seems to be skillfully curated as well. It’s yet another reason to get out the vote.